Intelligence sources have told Bill Gertz at the Washington Free Beacon and Anthony Capaccio and Sam Kim at Bloomberg that North Korea tested its KN-11 submarine launched ballistic missile from a submersible barge, not a Sinpo-class submarine, and that the missile flew only a short period. Satellite images and open source information seems to support this account. It is important to note that this does not mean the test was a fake. This is a normal test to conduct in the early stages of an SLBM program — even if Rodong Sinmun and KCNA are exaggerating a bit. In fact, it would be strange if the North Koreans did not conduct such a test before moving to a full flight test. The United States and Soviet Union, as well as other states like India, all conducted such tests. Here are a picture and a schematic of a Soviet submersible barge known as PSD-4. One of my colleagues, Dave Schmerler, noticed something very interesting. 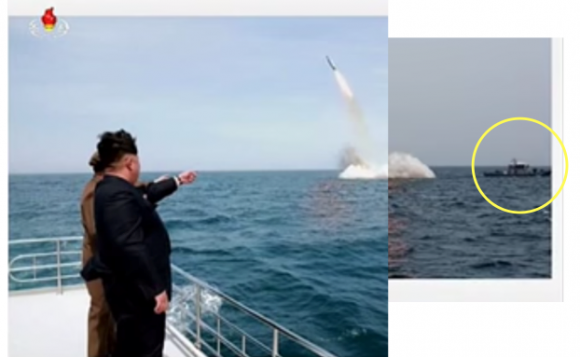 Although all of the images released by Rodong Sinmun and KCNA were carefully cropped to give the impression that the launch was from a submarine, one of of the images in the larger set broadcast on television was not so carefully handled. One can see the ship used to tow what I presume is a submersible barge. I’ve stitched two images together so you can see what I mean. The presence of a surface ship so close to the ejection and launch basically rules out the possibility that the launch was from a submarine. Dave also noticed — as have others including Joe Bermudez and H.I. 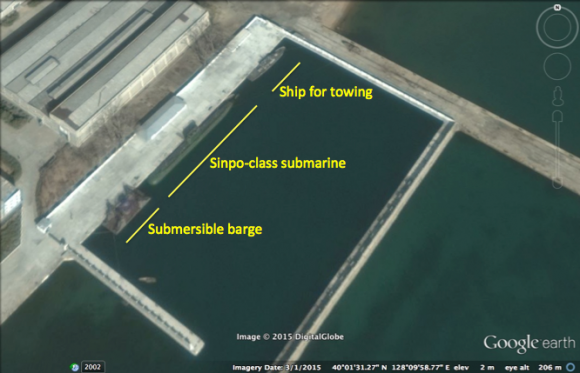 Sutton at Defence Blog — that GoogleEarth has satellite images of Sinpo from December 2014 and March 2015 showing a submersible barge that looks a lot like PSD-4, the Soviet one mentioned above. 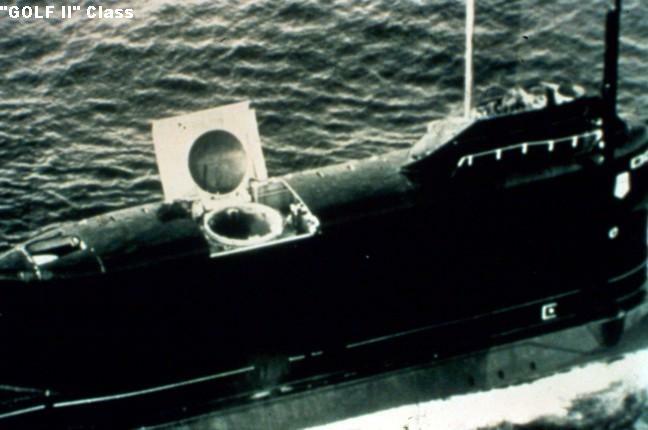 The March image also includes a shot of a Sinpo-class submarine with what looks like two launch tubes and ship that looks very similar to the one apparently towing the barge above. I am really looking forward to Joe’s article, which 38North is publishing today. (Update, 12:52 PST | I’ve added a link to Joe’s piece, which is as always very good.) Meanwhile, Melissa Hanham and Dave are busy measuring and modeling. There is another important detail — the missile seems to have flown only a hundred meters or so. Again, this does not mean the test was a fake. It is normal to conduct an ejection test, followed by only a partial burn of the missile’s fuel. 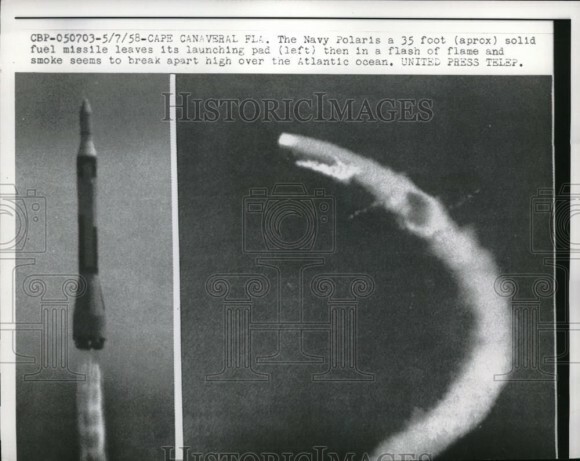 This is an image of a US Polaris missile breaking up in flight a few seconds after ejection and launch. While this test looks like a failure, it was not. It was one of a series of tests where the Navy ejected the missile and then burned a small amount of fuel. The test is well described in contemporary news accounts. Here are a pair of stories from the May 9 and June 7, 1958 editions of the Chicago Tribrune. These stories report on tests that are analogous to the test conducted by North Korea — ejection tests followed by a short burn of the missile. One can see Navy officials claiming the missiles were intended to break up once the small amount of fuel was exhausted, with the reporter not quite believing them. In hindsight, though, it seems the Navy was being truthful — later reporting is brutally honest about the first six Polaris launches, all of which failed. As I say, I think this is a real milestone in a real program. But it does raise the question of how quickly North Korea might conduct a full-range flight test (or something close to it) and how quickly they might deployed such a capability. The pace of US flight testing in the 1950s was quite intense — following the tests in May and June — and there are some other tests in here — the US attempted a flight test in September 1958. While there were many failures, the Polaris was in service by 1961. The US Naval Institute has a nice timeline. India, too, conducted a similar test in 2008 — but India’s program proceeded at a much more leisurely pace. India’s Sagarika SLBM did not enter service in 2013. Where North Korea ends up, I don’t know. I have a hunch, since Kim Jong Un is so closely connected with the program, that the pace of testing will be relatively brisk by North Korean standards — at least as long as Kim Jong Un stays in power. I don’t think a flight test by the end of the year is out of the question. I absolutely agree that this was a real test and that it was from a submersible barge. What I am having a hard time believing is that the Sinpo class are intended as a ballistic missile boat. It just doesn’t seem big enough, either in overall size or in the dimensions of the conning tower, unless its an unusually small missile. A vessel that size seems more logical as a replacement for North Koreas Romeo class SSK’s. I hear what you are saying. We’re trying to measure the apparent tubes in the sail now. We’ll see what we end up with. The conning tower can hold a missile of maximum 1.25m diameter. I would seriously question *why* they’d make the tubes 25 cm smaller than the missiles that they are widely reputed to have “acquired” and based at least one indigenous design on, and what appears from visual evidence to have been what was fired here. The drag and acoustic signature and weight/balance issues with the extra tube size are not an issue as far as I can tell (without the Sinpo class plans, this is a somewhat educated guess, but I will happily spend offline time with anyone else with sub design / naval architecture background talking about this if you want). If you’re saying it’s 1.25 NOT 1.5, you are essentially calling into question the entire SS-N-6 / R-27 Zyb in NK hands story and suggesting that the shaping of Musudan and the apparent missile tested here shape and flame/smoke color are all a cover story and faked. Is that in fact what you intended to do? What we know-to-be-true-with-physical-evidence about this program is approximately zero; it’s all entirely pictures and intel leaks so far. And a disinformation campaign could fake pictures and intel leaks. But, there’s been a very consistent story for a while now. I am not saying that but the GE mensuration says so. I can’t upload images here. Sent one to Jeffrey to pass it on to you. The total width of conning tower is 2.5m. The silo width is maximum 1.45m. Anything above 1.25m in diameter will be fitting very snugly to afford firing. The measurements on the barge are larger to fit the SS-N-6 / R-27. The measurements on PSD-4 will also be similar. Joseph S Bermudez Jr measures the shipping canister on HETT as 1.5m in diameter. Obviously the missile inside will have to be smaller than 1.5m by at least 20cms so as to leave 10cms gap on both sides of the missile inside the canister for padding. I would question the premise that the conning tower on the Sinpo submarine is even especially “blocky”, certainly when compared to either the Golf class or the Chinese Type 032. And the Golf class also used missiles with a smaller diameter than the R-27. And its not just the size and shape of the conning tower which makes me question this boats role, the entire boat looks too small, its only about two thirds the length of the Golf class and it looks notably slender. I reserve the right to be completely and totally wrong but everything about that submarine seems too small for it to carry a pair of R-27s. Sorry if I’m really behind here (just a curious amateur), but are you guys saying this sub or a theoretical NK missile sub launches the missiles from the conning tower? Are their any other missile subs that do this? Yes, that’s how the Soviets did it at first. I don’t follow. If it is a submersible barge, why is it not submerged? Well, you can see the image and schematic of the Soviet version. It is a launch tube on a barge and can be sunk underwater to simulate launch from a submarine. It is submerged. The boat probably towed it into place. The SS-N-6 aka R-27 aka Zyb is 150 cm diameter, about 59 inches. That’s a tiny bit bigger than a Polaris tube. The sail on that sub is way too blocky to not have a couple of cylindrical tubes in it; they are about 150 cm openings, but someone should be doing better modeling to try and confirm that. They are clearly around the right size. If it’s not that, it’s a whole sub with a bulky (and probably loud) sail setup for no good reason, which is a lot of money. Slightly surprising to me, is no loadout facility for the sub or barge tubes at that dockyard. One could do it with a random crane, but given the propellants there one would think they’d have built a gantry etc. If that is an R-27 Zyb derivative using the same fuels, that exhaust plume doesn’t look right. I agree a short burn would confuse things but that’s just not a color I associate with N2O4/UDMH. The plume was reddish-shifted, and there was red smoke above the gas-generator dirty and steam/water froth cloud at sea level. Not conclusively NTO/UDMH but “about right”. Pictures of the inert device ejection test, with no rocket motor, would let us calibrate the gas generator exhaust and water spray cloud to know where we could expect to see the NTO/UDMH exhaust residue, but I think we can use reasonable judgement with what we did see. Its not pure tube penetration; need some hatch covers/mechanisms to provide suitable openings. Can a Soviet/Russian analyst weigh in as to the Golf launch profiles? I’m surprised the DPRK would be going in this direction. Even if this program is successful they would just end up with a sea-based liability. The next time the DPRK sinks a ship, lobs artillery on RoK soil, or any other type of provocation their SSB will be lost at sea the moment it leaves port. And there would be plausible deniability. Domestic-produced Zyb + refurbished Russian 629As + a possibility of drawing equipment from the Type 6631, seems to have been a long held plan which makes best use of their particular expertise. I look forward to the photo analyses looking for the specifics of how much was photoshopped. I see what looks like ground launch debris in the ‘smoke’. I don’t see characteristics of a launch pulse in the water and finally I don’t see the expected ‘exhaust contrail’ between the missile plume and the persisting ‘splash’. For extra credit; is the apparent flight angle a control failure or deliberate turning way too early? I expect that ‘firing’ of the Defense minister might have plausibly be tied to advocacy of a program notably less successful than portrayed. Andrew Haggard has noticed something yet odder than these things. Jeffrey — thank you for starting the ball rolling with a good post. Commenters — thank you for the interesting and entertaining discussion. Finally, Jeffrey, can you tell us where to find Andrew Haggard’s odd things? just one or two ballistic missiles per ship; conventional dissel-powered submarine, which should surface within two or three days. This may be a disrupting, hard-finding target. but far from being a ‘game-changer’ which will alter military balance in this region. i believe seoul and washington will come up with countermeasures before pyongyang make that stuff become operational. 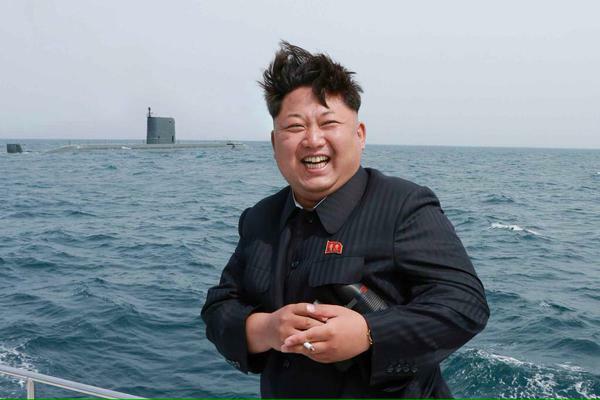 Submarines in DPRK coastal waters might be challenging. Submarines cruising across the Pacific snorkeling or surface running most of the way with 2 asserted nuclear warshots in the sail during a state of war (its just an armistice)is a SINKEX with less planning. We would not require cracking Enigma for this one. I expect the USN and JMSDF and most other navies have a standing sink order for this situation. The North Koreans do have snorkels, so they don’t have to surface for a month or two if they don’t want. And they can demonstrably hold their own against the South Korean navy in littoral operations. So a couple of Sinpos operating in the Sea of Japan with a dozen or so Romeos or smaller coastal boats in support, with missile boats and land-based aircraft harassing allied ASW forces for as long as they last, would add a significant new dimension to the purely regional threat. That does change things. As a threat to the continental United States, or even Hawaii, J_kies is right – the Sinpo isn’t that boat, and North Korea can’t build that boat any time in this decade. The Sinpo/KN-11 combo, if and when they get it working, is for threatening South Korea and Japan in a new way that complicates our planning. OK, first: the Sinpo would be a very tight fit for an R-27. Not saying you couldn’t shoehorn one in, but why would the DPRK even try? They’ve build boats with a larger displacement than the Sinpo, and they can almost certainly build a slightly fatter hull and sail to give them more room to work with on an experimental system that is likely going to require a bit of refinement. And that 9.5×1.5m shipping crate is a bit tight for an R-27 as well. Second: North Korea as far as we know has never successfully flown an R-27 or anything with a full R-27 engine. They have a limited supply of ex-soviet hardware to work with before they have to mix in the risk of domestic production. I really don’t see them trying to sea-launch an R-27 variant before they’ve even land-launched one. Third: They don’t need anything like that capability in the first place. No realistic North Korean SLBM is going to reach DC from the Pacific, and the rest of their plausible target set is essentially coastal. They need enough range to avoid littoral ASW forces while shooting at peninsular or island targets, and not much more than that. Fourth: Leaving the water at ~75 degrees is almost certainly a bug, not a feature. You don’t want to make that turn while you’re dealing with the sea/air interface, and the North Koreans have already mastered the art of doing the turn in air after vertical launch. That argues somewhat against this being a photoshop job – their supply of stock imagery will be vertical at launch – but does indicate that they’ve got more work to do. I see a new missile, not a straight copy of anything the DPRK has shown us before, with a ~6.5:1 length to diameter and a plume + smoke trail more consistent with Kerosene/IRFNA than either NTO/UDMH or any sort of solid. None of those observations is of high confidence with this imagery, but my best guess would be straight Scud/Nodong technology reshaped to a 1.25 x 8 meter package to best fit the Sinpo. Will try to work up some performance curves later.